Not much newsworthy happened in Linnton during the ensuing several decades. Built in 1852, a wagon road extended along the river from Portland to a spot across the channel from a Sauvie Island farm, encouraging connection between the two hamlets. Shiploads of grain from the Tualatin Valley continued to flow from Linnton and Springville, but much of Linnton's activity was centralized in the southern part of the village where a tent camp had been established to receive pioneers who had floated their Conestoga wagons down the Columbia River after leaving the Oregon Trail in the Dalles. A blacksmith shop did a thriving business there, along with merchants selling supplies to the new arrivals. It was here they rested as they contemplated where to finally establish their land claims and settle their families. Many chose the Tualatin Valley and it's rich agricultural promise. In 1849 the camp thinned dramatically as many left for the gold fields of California. In 1872, the Springville warehouses burned down to the water's edge, sealing the fate of Linnton's main competitor, and clearing the riverbank of many of its business interests. 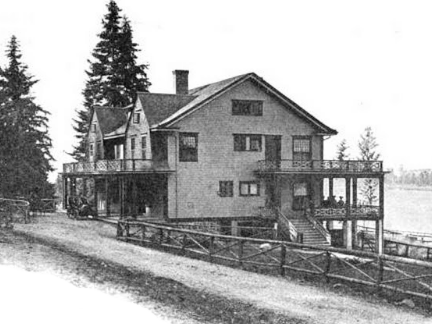 That little town remained fallow until 1909 when the Whitwood Court subdivision was developed, which started to attract Portland residents once the United Railway established an electric line to Linnton. This ran for a few years, but when it tried to double it's 5 cent fare to 10 cents, Multnomah County became so incensed it rescinded the permit and made United tear up all its track that ran along St. Helen's road, one more disappointment to the area residents. Another false start to the industrialization of Linnton transpired in 1889, when the Portland Smelting and Refining company started to build a refinery there. It became operational in 1891 but was fraught with internal political warfare to the point where the Portland constable was called out to settle a dispute for squatters rights at the plant. Sadly, about the only thing it produced was rust. One more short-lived Linnton enterprise was a meat canning factory that specialized in horsemeat. The coming of electric power to the streetcars and other transportation systems put a lot of horses out of work. Of course, they still needed to be sheltered and fed, making them a costly problem for their owners. Also, Eastern Oregon had an abundance of cayuses, which consumed much of the grassland the ranchers wanted for their range cattle. Getting rid of that competition would be of great benefit to everyone, except, of course, to the Indians that owned them. Those unfortunate creatures (not the Indians, thank God) were rounded up and crammed into boxcars for the trip to their end in Linnton. A horse in those days was worth $2.50 if it wasn't a specialized breed. This establishment was not thought of highly by the citizens of Portland, and Linnton folks were given the moniker of "horse canners.” Their baseball team even carried that name. It was at the turn of the century when Linnton's glory days began. As we can all see, the Tualatin Mountains around us are chuck full of timber. Saw logs and their required machinery found their way into the welcoming town, and would continue to bolster the economy for many years. First to come was the Linnton Manufacturing Co. in 1892. It constructed wooden boxes for shippers in the area, including the fruit orchards blossoming all over the Northwest. Columbia Engineering Works nosed its way into the waterfront, building up to four tall-masted ships at one time. Their vessels were well appreciated, and in good demand. Using steam power for their mechanics, this company brought in skilled laborers from many different places and disciplines. At one time their workforce numbered 400 to 500 people. Timber, however, ruled the town. There were 6 sawmills at one time, comprising the most valuable part of the harbor. Probably the largest and most well-known operator during the early 1900s was the Clark & Wilson lumber company. Wilson Warner Clark and his father purchased the property from Robert Suitor, who built the first mill in 1904 that would later become known as Linnton Plywood. When a major earthquake struck Japan, orders for construction materials poured into the company. In 1907, only two years after taking ownership, they purchased 10,000 acres of land near Gobel for $800,000 ($19,000,000 today). It contained 400 million board feet of fir and cedar, and was the biggest land transaction of Columbia River timberlands ever. Fire destroyed their mill in 1947, and Linnton Plywood rose from it's ashes in 1950. The main sawmill of Clark and Wilson occupied the site of what recently was the Glacier NW sand reloading yard, where sand dredged from the Columbia river was marketed. Both Glacier and Linnton Plywood are now gone; only the creosoted pilings and the linked chain conveyor that dragged logs out of the river remain. More than three dozen Cormorants roost on those pilings today. In 1910, when Linnton incorporated herself in preparation for a bid to be absorbed by the city of Portland. it was heavily in debt from issuing bonds to supply itself with Bull Run water, which made Portland skeptical of the idea. But, when Portland Fire Chief David Campbell was killed fighting an oil fire at the Union Oil storage tanks in Portland, and the city subsequently banned the storage of large quantities of gasoline within the city limits, Portland began to look at Linnton more favorably, as evidenced today. It eventually annexed the community in 1915, but made no infrastructure improvements there for many years. But I digress. Our focus remains on the early part of that century, and the creation of one of those aforementioned drinking establishments, the Claremont Tavern. The Claremont was designed to be similar in nature to the Claremont Inn of New York City. Constructed in 1905 for owners Sol Blumauer and J. Eugene Hoch, at a cost of $458,000 in today's dollars, it featured wide verandas with beautiful mountain and river views and large open fireplaces. The building was leased to Harvey Winsor, a well-known caterer in New York City and was to have "cuisines that equal that of the great Eastern hotels." The owners claimed it was the finest roadhouse east of the Missouri River.